Norma Taylor, 93, Frankton, passed away on August 13, 2018 after a brief illness. She was born February 27, 1925, in Elwood the daughter of John and Goldia (Hall) Strangeway. She was the oldest of six children. She married Edward Taylor on August 3, 1941 who predeceased her in 2003. After her children were raised, Norma was secretary at the Frankton Elementary School for seven years. She had always longed to be an elementary teacher so she resigned and began her education at Anderson College graduating with honors in three and one half years with a Bachelor of Arts in Education at the age of 48. After graduation, she went back to Frankton Elementary School and taught students in the first and third grades for fifteen years and during this time she received her Master’s Degree from Ball State University. For the rest of her life she would hear, “you were my teacher” from many former students who loved her dearly. 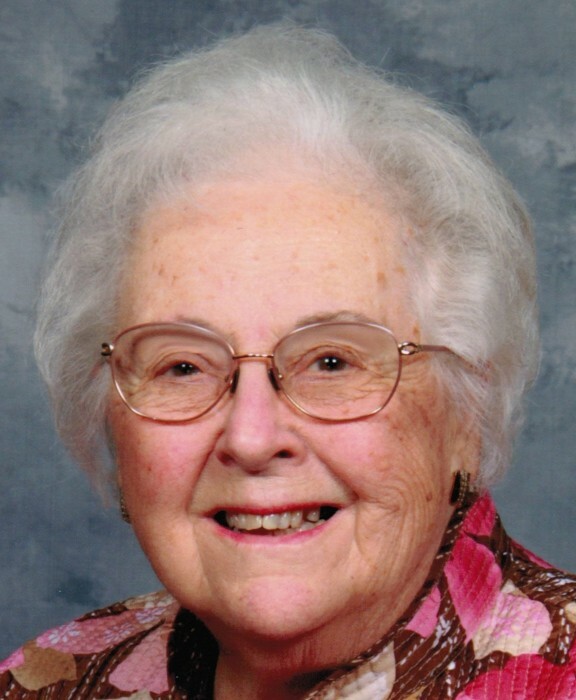 She attended Frankton Christian Church and loved being involved in the Women’s Bible Fellowship, helping with funeral dinners, and was known for her coconut cream pies. Norma at the age of 90 taught the first grade class during the summer at Vacation Bible School. She was an avid reader and was a member of the Frankton Library Book Club. Norma also belonged to Retired Teachers, Frankton Home Ec Club, and Friends of Gladys Tabor Book Club. Our family was blessed in having her as a loving mother, grandmother, and great-grandmother. She had a kind and generous spirit in giving to others. In Norma and Ed’s giving they especially supported many missionary causes. Survivors include son, David (Judy) Taylor of Muncie; daughter, Karen (David) Monroe of Anderson; grandchildren Holly (Michael) O’Neill of Fishers, Julie (Chris) Chelli of Lapel, Chris (Eva) Taylor of Cicero, and Ben (Chelsea) Taylor of Muncie; great-grandchildren Jesse and Tony Chelli, Allison and Logan O’Neill, Stella and Wyatt Taylor, and Coda Taylor. Also surviving is one brother, Jack Strangeway of Frankton and many nieces and nephews. She was preceded in death by her husband, Edward Taylor; sisters, Sharlene Wellington, Pat Cooper; brothers, Robert and Jim Strangeway. Visitation will be from 12:00 to 3:00 at Dunnichay Funeral Home in Elwood on Sunday August 19 with a celebration of life service immediately following. Graveside service for family and friends will be held on Monday at 11:00 at the Elwood City Cemetery.